When you distill it down (no pun intended), the things we eat are basic parts of culture- just like art and music. Luke Schmuecker is one of the people in our community of wine geeks and foodies who is always looking for the next thing to learn. He’s a bastion for edible and drinkable culture who has taught me more about beer and cider than anyone else I can remember- and he’s happy to teach you, too. 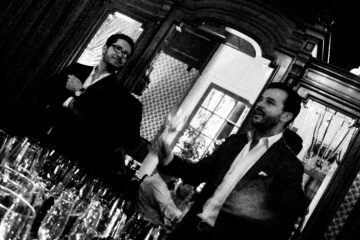 Luke is on a mission to help people drink better- I can’t think of a more noble pursuit. Here’s his account of a recent trip to Vermont, where he got an in-depth look at one America’s most important national treasures- cider production. Cider is the liquid that hydrated the original pilgrims, and fueled their first celebrations. Cider fortified soldiers during the War for Independence, animated debates about how to create a new government, and then lubricated a Civil War. I’m convinced American cider is worth discovering, all over again. After about the fifth time I stopped our rental car to pull over and grab apples from unclaimed trees on the side of the road I came to a pretty well-known conclusion, Vermont has A LOT of apples. Living in Southern California and working in the beer industry, it’s easy to lose touch with the source of what you are drinking. We Californians have a lot of local breweries, but the raw materials used in the production come from all over: hops from the Pacific Northwest and grains from the Midwest or Europe. When you think about cider being produced in New England, this disconnect simply doesn’t exist. When the early English settlers started coming to America, they needed something safe to drink (water was a no-go) so they brought over apple seeds and cuttings (scions) to graft to trees. They also brought over supplies to grow malt and grapes for wine but unfortunately, those were not as easy to cultivate in New England. Anyone who has driven through New England in late fall knows how prolific the apples trees are, and so (unsurprisingly), cider production started booming. The apples that existed over 100 years ago were very different from a majority of the apples grown in the US today. They were misshapen, tannic and bitter which made them perfect for making cider. Before prohibition the variety of apple trees in the US was very diverse. 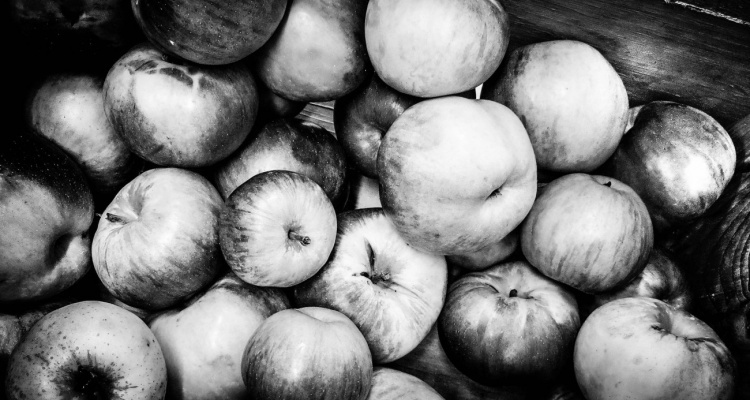 Apples ranged from tiny tannin bombs, to sweeter varieties which allowed cider producers to blend the resulting juices and achieve the perfect balance. Unfortunately during prohibition, a lot of the trees that produced apples for cider were cut down. We had crazy prohibitionists burning down orchards -farmers were left with no choice but to start producing sweeter “non-cider” apples. While other beverages like beer, wine and spirits bounced back after prohibition, cider did not recover as well. Recently, cider has been going through its own renaissance. As the market becomes more interested in artisanal and local products, cider producers are focusing on traditional cider varietals and production methods. These producers are also cutting back or eliminating the sugar and additives. You have people like Dan Pucci at Wassail in NYC pushing adventurous drinkers to explore everything from traditional Spanish sidras to Normandy ciders and local ciders produced using native yeast and foraged apples. This brings me back to why I found myself collecting apples on the side of the road, in the middle of nowhere. We drove for hours, to visit two guys hanging out with cows (sorry, highland cattle) and producing artisan cider. David and Colin of Shacksbury cider started their company after a successful kickstarter campaign known as the “lost apple project” back in 2013. Their goal was to build an orchard and grow heritage apples historically used for cider production. Although their heirloom orchard is young, they have the advantage of being located in rural Vermont. Even more fascinating, in the surrounding area there are a lot of “lost” apple trees. These are trees that have been around since before prohibition and were never grafted over to sweet juice apples because people either did not know they existed, or just didn’t care. In the wine world, it would be like stumbling across 60 year old Nebbiolo vines in the Langhe. One of the Shacksbury ciders, known as “Lost and Found”, is made using wild foraged apples from trees that are over 100 years old. Once pressed the cider is fermented using native yeasts and is bottled unfiltered and with no added sulfites. There were only 240 cases produced this year. If you can get your hands on it, buy it. Driving around Vermont, you might never suspect that this idyllic countryside is home to some of our countries most prized cultural jewels. David and Colin are lucky enough to have some pretty amazing neighbors just down the road from Shacksbury. They are close to Whistle Pig Whiskey, Twig Farm (producer of some amazing goat tomme) and Windfall Orchards. These local farmers trade cider for cheese, share apple presses, and are currently working on several experiments, including a possible collaboration with Whistle Pig to some of the whiskey barrels to attempt ageing cider. However in true Vermont form, if you were to drive unknowingly through this area, you would have no idea these places even existed. There are no signs, no million dollar tasting rooms, zero tour buses, and absolutely no tourists… which to me, is one reason it is so great. Benjamin Franklin once said, “He that drinks his cider alone; let him catch his horse alone”. This testament to the true community nature of food and drink reminds us that cider was, and still is, something that is meant to be shared with friends. For the past couple years, especially on Thanksgiving and Christmas, I have been substituting ciders for sparkling wines to welcome guests and start meals. Cider is nostalgic and all-American, but it’s also responsible, current, and hip. Find some. Try some. You’ll like it. Luke Schmuecker is the CMO and a Co-Founder of The Beer Exchange, an online marketplace that enables craft beer drinkers to purchase or trade for any beer (or cider) they want. *All photography in this post courtesy of Luke and Amberly Schmuecker.